#AskYounusAlGohar – How Do Inanimate Objects Communicate? The following is a transcript of Younus AlGohar’s reply to a viewer on YouTube live. #AskYounusAlGohar – Can You Convince Me Intellectually to Believe in HDE Gohar Shahi? His Divine Eminence Gohar Shahi does not cater for your intellectuality. HDE is more concerned about your spirituality – about enlightenment of the soul and purgation of your Carnal Self. HDE Gohar Shahi estimates the possibilities of whether or not God will allow you into his friendship. Those who say, ‘Imam Mehdi will kill non-Muslims,’ are ignorant of the truth and the Koran. It is a common misperception in Muslim circles that Imam Mehdi will impose Islam on the entire world. The concept of Imam Mehdi was given to Muslims through celestial scriptures, from God. Similarly, the concept of the Messiah in Judaism is also from celestial scriptures. If the Jews think the Messiah will impose Judaism and the Christians think Jesus shall impose Christianity, while Muslims think Imam Mehdi shall impose Islam; this causes a lot of confusion. God has given the concept of an Awaited One in all celestial scriptures and if a Muslim thinks only Islam’s concept is correct, that person is not a true Muslim. Muslims are required by their religion to believe in all prophets, messengers and the four celestial scriptures. Now the concept of Imam Mehdi is from God and the concept of the Messiah is also from God, therefore how is it possible that God will send Imam Mehdi to spread Islam and the Messiah to spread Judaism all over the world? Does God have a plan to wreak havoc and cause bloodshed? It just doesn’t make any sense. This is often translated by clerics as: there is no compulsion in the religion. However, this is a misinterpretation. It actually means: do not do anything in the religion that makes you feel disgusted. How can you not feel disgusted, killing a 6-month old baby just because his parents did not accept Islam? This is against the principles of Islam and the Koran. A Muslim would say that the era of Prophet Mohammad was the best and yet we know that even in the era of Prophet Mohammad the Islamic flag did not reign over the entire world. Imam Mehdi shall be greater in eminence and possess more knowledge than Adam Safi Allah; how can any Muslim attribute violence and bloodshed to Imam Mehdi? Those sects in Islam who claim that Imam Mehdi will use the power of his sword to impose Islam on the entire world, I have a question for them: has Islam not always been subjected to bloodshed? In order to eliminate bloodshed from the nature of man, God granted Adam the Knowledge of Eminence; it simply means Muslims do not know what the Knowledge of Eminence really is nor do they understand what is written in the Koran. How can it be that Imam Mehdi will possess this Knowledge of Eminence, which was given to eliminate bloodshed and at the same time he will cause bloodshed and kill all who do not accept Islam? How can good and evil coexist together? Adam Safi Allah was given the minimum knowledge of how to generate divine light from the name of God. Imam Mehdi will not only possess the knowledge that was given to Adam, He will also possess and dispense the knowledge of how to obtain enlightenment from the sub-spirits of God (Jussa Taufeeq-e-Illahi/Tifle Noorie) and He will even dispense the knowledge with the help of which one will be able to see God (Deedar-e-Illahi) and the method by which one can come under the theophanies of God. God has invested all his special powers and authority within Imam un Mubeen [Koran 36:12]. Imam un Mubeen (The Elusive Imam) means the one who does not have to be searched for; His grandeur and majesty is such that it speaks for itself. People will be humbled before him and compelled to believe that only He can be the Imam un Mubeen. Those who still maintain to reject Him, despite seeing all the signs, are those whose eyes are blind and heart is blind. There are 27 Haroof-e-Mukatiyat (The Disjointed Letters). All prophets and messengers together only brought down the knowledge of 2 letters and Imam Mehdi shall bring down the remaining 25. How much knowledge that must be! Adam’s eminent knowledge was merely a pinch of knowledge compared to the knowledge Imam Mehdi shall dispense. Imam Mehdi is dispensing the secretive knowledge of God (Ilm-e-Ladduni). Those who think Imam Mehdi shall pick up the sword are not only blasphemers of Imam Mehdi; they are blaspheming and rejecting the Koran, Prophet Mohammad and God. Can any cleric legitimately say that according to Islam, one who is involved in bloodshed will go to heaven? Only those are involved in bloodshed who do not possess the Knowledge of Eminence. In other words, one who is involved in bloodshed in the name of God/religion is trying to prove God wrong. Those who have obtained this Knowledge of Eminence only spread peace, love and connect people with God. Prophet Mohammad did participate in wars, however, not a single infidel died from his sword. In those days, the Arab mentality was such that the weapon was seen as a man’s power. According to the mentality of the people at the time, had Prophet Mohammad not held a sword, they would have seen him as a coward. However, Prophet Mohammad never killed anyone. If God gave Adam the Knowledge of Eminence to eliminate bloodshed, he must have given Prophet Mohammad something even greater; so that neither Prophet Mohammad nor those who were in the physical and spiritual company of Prophet Mohammad would have the urge to cause bloodshed. All religions allow one to hold a weapon in self-defence, provided you are being attacked by the enemy. However, there is no religion that allows you to use a weapon to enforce your religion upon others. Therefore, having this conjecture for Imam Mehdi is utterly blasphemous. Imam Mehdi will not kill any Christian or Jew. The message of Imam Mehdi is love and the knowledge Imam Mehdi is dispensing is far greater than the Knowledge of Eminence granted to Adam Safi Allah. The following is a transcript of Younus AlGohar’s speech, originally posted on his Medium page. 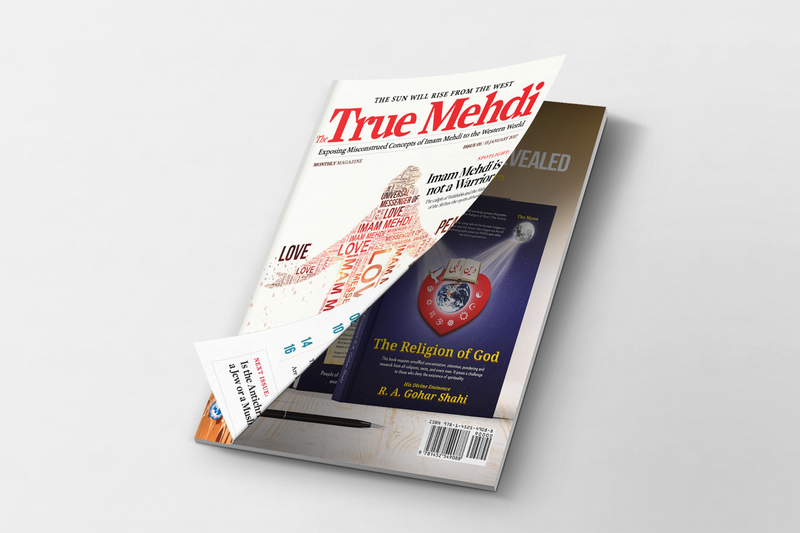 Mehdi Foundation International, Messiah Foundation International, and Kalki Avatar Foundation are excited to announce the first ever issue of the monthly ‘The True Mehdi’ Magazine which is now available online! This magazine was created to expose the misconstrued concepts of Imam Mehdi to the Western World and provide information about the true Awaited Imam Mehdi. Read it online here. When this comment was shared with Younus AlGohar, he elaborated on the subject. #AskYounusAlGohar | Minjanib Allah Hidayat Par Kaun Hai? Younus AlGohar answers a question from a viewer about the technicalities involved in performance of worship whilst facing the Kaaba (in Mecca). Whilst doing so, he explains how God grants guidance. – As long as your heart is not connected with God and directed towards God, you’ll need to respect the pointer that is the Kaaba. The destination is not the Kaaba; the destination is God. When your heart is enlightened and directed towards God, then you can face anywhere and perform Salat (worship). When God is in you, you will be greater than the Kaaba – the Kaaba is just stone whereas man has the potential to be the greatest of all creation. When God is in you, the Kaaba will circumbulate you. – In the first instance when you’re being guided, your heart generates divine energy (Noor). That divine energy will first clean your heart, and then if your heart is fully enlightened, the divine energy will enter your bloodstream. As long as the divine energy generated in the heart is only enough to take care of the needs of the heart, you will be known as just a Momin (true believer), but your heart won’t be directed to God. – The prayer mentioned in Quran 1:6-7 is for those who have already awakened their heart, but they want God to turn their hearts towards him (and reach the stage of Qalb-e-Muneeb). This verse is asking God to take them towards the blessing of seeing God. For Momins, the heartbeats are the legs through which you walk on the Straight Path. The second part of this prayer asks God to not put them on the path of those who have earned his anger. Those people have earned his anger who worship God and invoke his name whilst ignoring the conditions he has put on them to do so – namely, they have not awakened their souls and they have ignored spiritual knowledge. God does not accept the worship of the people in whose fate he has not written faith. – Imam Mehdi Gohar Shahi has explained how to recognise if God has guided someone. God guides the heart. It is not your fleshy heart that God guides. It is the spiritual heart that sits atop the fleshy heart. There are 180 000 veils on top of the heart that do not get burnt through worship, fasting etc. To awaken the heart, you need the merciful sight of the spiritual guide, which will burn those veils. The spiritual guide will implant the seed of God’s name in your heart. Then the repetition of God’s name in your heart will begin. This is guidance from God. – Guidance from God is not given without God’s permission. Before the spiritual guide implants the seed of God’s name in the aspirant’s heart, he takes his likeness to the court of God. God asks, ‘Why have you brought him?’ The spiritual guide replies, ‘He wants to befriend you.’ Then if God is in the mood to guide the aspirant, he will investigate his beliefs and actions. After being completely satisfied, God will command that his heart be initiated with God’s name. Then the spiritual guide, with God’s permission, will implant the seed of God’s name in the heart of the aspirant. #AskYounusAlGohar | Ibadat Ke Bawajood Aaj Ka Musalman Maghloob Kiyon Hai! Younus AlGohar speaks on the misconceptions about God’s love that most Muslims have. – The main goal of every religion has been God’s love. There is a misconception about divine love: people think their worship and fasting is proof of their love for God. However if we ask them, ‘If you wife does everything for you, is that a guarantee that she loves you?’ So then how are your prayers, fasting and giving of alms guarantors of your love for God? It may be that your wife cleans your clothes, looks after your kids and cooks and cleans because she lives in your house; if she doesn’t you might divorce her. Similarly you might worship to avoid hell. – If Muslims would become a lover of God from worship, why are they separated into different denominations? The first condition in Islam, the core of the religion, is declaration by the tongue and affirmation by the heart – which Muslims today don’t have. Their hearts don’t have divine energy; they don’t have faith. – Proof that Muslims today are not Momineen (true believers): according to the Quran, God said they would be dominant upon the world as long as they were Momineen. Today, Muslims are not dominant upon the world; rather they are suffering. This proves they are not Momineen.